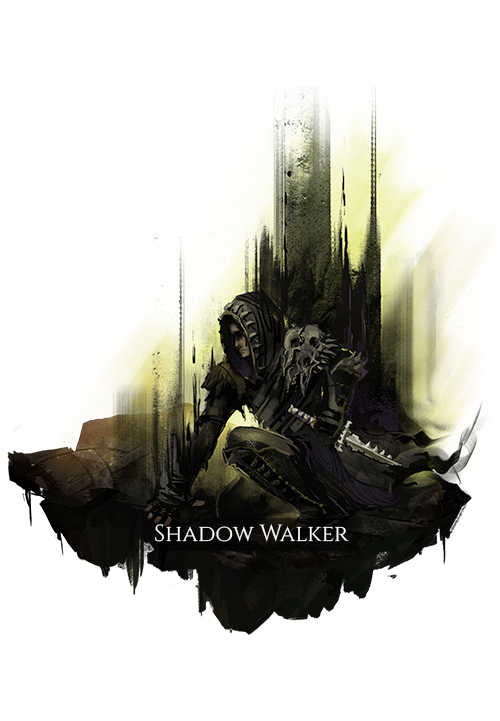 Shadow Walkers are skilled at traversing the Veil, but can also move through the night with additional bonuses, as compared to the other stealth-using classes. However, they are more vulnerable in bright sunlight. Their origins are shrouded in mystery, but it is said that Shadow Walkers come from an unknown world that conforms neither to Norse cosmology nor what is known of the pre-Piercing world. The first Shadow Walkers learned their abilities in great fear, a tribe hiding in darkness from a powerful enemy. However, that fear became delight, as the ability to walk the shadows proved a deadly advantage. The shadows will always protect and strengthen us. Takes increased damage from radiant and fire abilities. Physical attacks deal reduced damage, and metal equipment causes self-damage when activating abilities. Preparation time for entering the Veil is greatly reduced based on concealment. A light dagger with moderate damage and low armor penetration. Does not affect concealment. The user exits the Veil and gains a shadow buff that grants high concealment for a brief duration. Inflicts high panic on nearby enemies, based on the user’s concealment. The user exits the Veil and draws any nearby enemies within the Veil into the natural world as well. Those enemies have a high amount of panic inflicted on them and are affected by a shadow debuff that greatly reduces their movement speed for a brief duration. Inflicts high disruption damage on the target. When the user is striking from behind, the target takes bonus disruption damage and is affected by a shadow debuff for a moderate duration that adds bonus disruption damage to subsequent attacks against them. Inflicts a shadow debuff that greatly reduces the movement speed, as well as increases the ability preparation and recovery times, of enemies who have reached their maximum panic rating. On removal or expiration of this debuff, the target’s vision is greatly reduced for a moderate duration. Applies a long duration shadow debuff to the target which periodically causes the illusion of a Shadow Walker to appear. It looks as though the Shadow Walker periodically emerges from the Veil nearby and performs a single attack against the target, before laughing and fading back into the shadows. Real attacks by Shadow Walkers against the target during the duration of this debuff consume it to add a large amount of power to the Shadow Walker’s first attack.